After several nights of budget meetings, City Council formally approved the budget for the coming year. There are a number of important investments in this year’s budget, such as improvements to Richardson Beach, advancing a new downtown parking garage at Queen and Montreal St, and more investment in affordable housing. The budget also maintains important investments that we have made to our transit system, and earmarks several million dollars for road repairs. At the same time, there was a lot of discussion around the table about the need to limit property tax increases. When I first ran for mayor four years ago, I pledged to hold property tax increases to the rate of inflation, while maintaining existing services. That’s not an easy task when you need to raise money for infrastructure repairs, fund important projects like the Third Crossing and the airport expansion, expand transit service and still maintain all of the other city services that our community requires. I commend City Staff for their work in managing City budgets carefully and working with Council to hold the line on inflation over the last few years. However, I believe the time has come where we need a new strategy for managing property taxes. We need to look at creative ways that we can further reduce property tax increases below inflation without having to cut services. That’s why I’m putting forward a new tax plan this coming term, where we use growth to limit property tax increases. Here’s how this would work. Every year the City sees a certain amount of growth in its tax base, from new housing, to new commercial and industrial developments. This baseline level of growth is built into the budget to help cover the costs of infrastructure repairs and improvements. If, however, we can embrace smart growth as a community and facilitate faster growth in housing to address the current housing crunch, we have the opportunity to push our growth above the baseline. 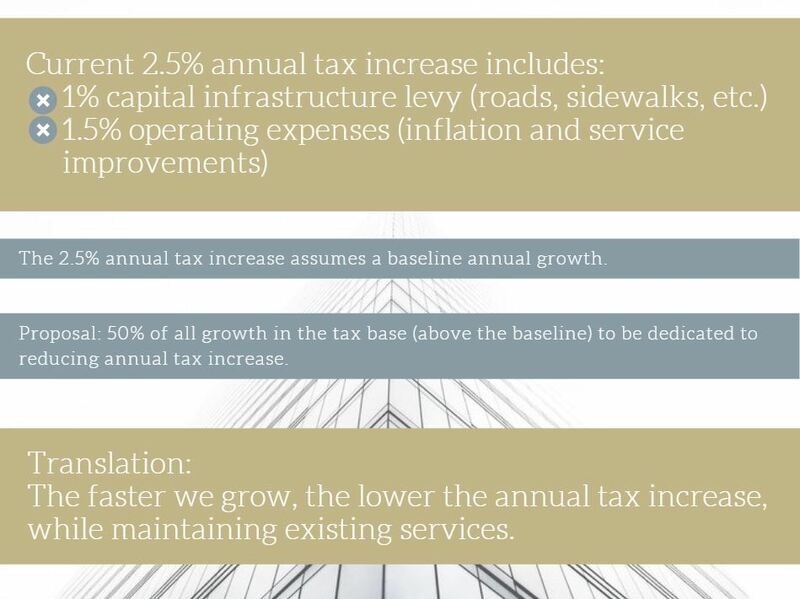 I’m proposing that 50% of all growth above the baseline be channeled directly towards reducing the annual property tax rate below 2.5%. With more growth in housing, not only will more people be able to find quality, affordable places to live, but as a City we will generate additional revenues that can be used to limit property tax increases below inflation without having to cut services. That’s my vision for smart growth for Kingston!